Here Come the Brides first aired on 25 September 1968. The series fictionalized one of Seattle's most beloved stories, the importation of dozens of single women from the East to Seattle during and just after the Civil War. Brides was inspired by the story of Asa Shinn Mercer, the twenty-five year old newly elected president of the territorial university. Of all his accomplishments, Mercer is most remembered as the entrepreneur who brought eleven unmarried women to the men of Seattle in 1864. Those women came to be known as "Mercer Girls." They either married bachelors or became schoolteachers. Lauded for his effort, Mercer brought a second installment of thirty-four "girls," in 1866. Their story is the perfect mix of adventure and romance, the perfect story for the June brides of Shades. In Puget Sound the scarcity of women in pioneer days was a serious matter. From time to time the newspapers mentioned the continued scarcity of women, but nothing practical was done to improve conditions in this respect until early in 1861, when a young gentleman, Asa S. Mercer, arrived in Seattle fresh from college. 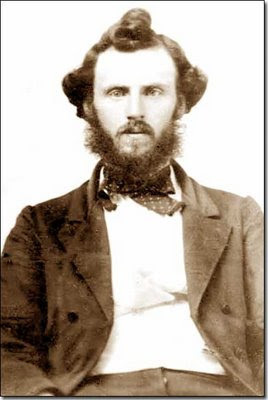 His elder brother, Judge Mercer, was one of the oldest and most influential pioneers in the territory. Judge Mercer often made it a semi-jocose comment that there was a dearth of young women. He often suggested an effort to secure territorial aid for bringing out from New England a party of young women who were needed as school teachers and for other positions, far removed from that of household servants. Photograph of Asa Shinn Mercer ca. 1862. Does he look like Jason Bolt to you? This set young Mercer to thinking on the subject. He talked the matter over with the governor of the territory and with members of the legislature, and while everybody favored the proposition, the public treasury was empty, so he failed to get territorial aid. Nothing daunted, he obtained generous private contributions sufficient to enable him to go to Boston. There the proposition was placed before the public for such of the young women as chose who had been made fatherless by the civil war to accompany Mr. Mercer to Washington Territory. Quite a large number evinced a willingness to go, but eleven only found courage to leave their friends and make a journey of 7000 miles into a wilderness. Most of the eleven paid their own way. The party arrived in Seattle May 16, 1864. Encouraged by his success, Mr. Mercer again went East in 1865 on a similar errand. Upon his arrival in the East he went to work and met with encouragement wherever he went. July 20, 1865, he writes: "I sail from New York August 19 with upward of 300 war orphans, daughters of those whose lives were given on plain and field in our recent war. I appeal to every true warm-hearted family to open wide your door and share your home comforts with these whose lot is about to be cast in your midst. I can cheerfully vouch for the intelligence and moral character of all these persons accompanying me," etc. Acting upon this information, a large meeting was held in Seattle to devise ways and means for the reception and care of the young ladies mentioned. The response of the people was so generous that had the large number thus expected really appeared they would have received a royal welcome and have been cared for most tenderly. However, Mr. Mercer was doomed to many disasters in this undertaking, among which was a scurrilous article which appeared in the New York Herald, slandering him and appealing to the girls to stay at home. Everywhere the article was copied, and before he could get his references printed and thus counteract the calumny two-thirds of the young ladies had written him, enclosing the article and declining further consideration of the matter. MARRIED—On the 15th of July, 1866, at the Methodist Protestant Church, in this city, by the Rev. Daniel Hagley, Mr. Asa Sbinn Mercer to Miss Annie K. Stephens, of Baltimore, Md. "The steamer, with lessened quota of passengers, left New York January 6, 1866, and ran at once into a storm, which lasted two days. As we recovered our normal condition we began to look about us. With great satisfaction we found that we had a party of intelligent, amiable, sprightly people. The unmarried ladies are mostly from New England, and can boast a fair share of beauty and culture, which characterize the best society of that region. It is impossible that the lovely girls who are with us should have left the East because their chances of matrimony were hopeless. One must look for some other motive. Their bright faces, wit and sound sense are, however, such that they cannot fail to bo desirable members of society in a new country." Douthit, Mary Osborn. The Souvenir of Western Women. Portland : Anderson & Dunaway, 1905. I loved that show, but back then I couldn't watch it much. I have had an interest in mail order brides, and others of same sort. this post of yours helps me a bit. I was so glad to see this. Now, I have got to go back and read it better. I'm so pleased you liked this article on "Here Come The Brides" and "The Mercer Girls." Travel then was so difficult that I am fascinated by these young women and their voyage. I don't think I would have been brave enough to have gone. Thank you for taking the time to stop and comment, I really appreciate it! That was my favorite show at the time .I named my first born after the handsome lead man on the show, Jason. I just loved him. A very interesting story. I didn't realize it was true until i saw your post. Thanks for the history!